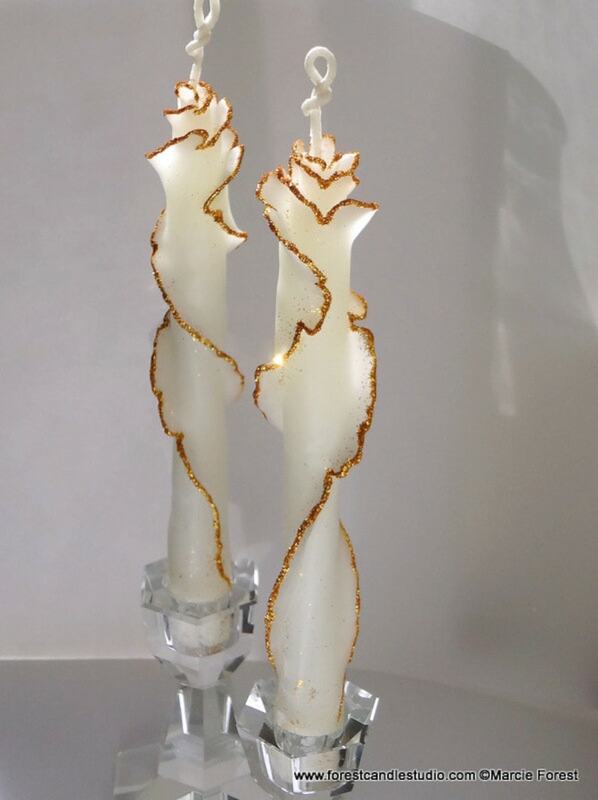 Exquisite decorative candles that catch everyone's attention when they enter your home or open them as a gift! These unique Glitter Rose Tapers are available in three sizes: 6", 8", 10". Each pair is handmade to order, expertly sculpted in natural white beeswax, adorned with your choice of silver or gold edging. No two candles I make look exactly the same. Available by request in other quantities &/or colors. Matching Glitter Rose Pillar also available (example shown in last photo). Contact me for info. This listing is for one pair of tapers ( a set of two candles) in 6", 8" or 10". If you need an additional one or two pairs (in any height or adornment color) add them to your cart if that quantity shows as available. Postage fee adjusts automatically for the additional weight (if ship fee turns out to be less to your location I'll refund overage paid). If you need more tapers than shown as available, contact me to add additional tapers to your order. Please tell me during checkout if you need to receive the candles by a specific date.